WHITE BUFFALO LODGES is located in Livingston, Montana. Since 1989 we have been creating beautiful, functional, handcrafted tipis, adhering to the original craftsmanship of the Plains Indians. Our easy to assemble tipis are durable, waterproof, fireproof, mildew proof, and environmentally friendly. We create a variety of nomadic shelters, using the highest quality materials. Plus, every tipi comes with all you need; cover, liner, poles, carrying bag, rope, door cover, willow lacing pins, and stakes. We are a full service tipi company and use the best materials available. We even assemble your product by hand in Livingston, Montana to assure stability and craftsmanship, before we ship to you. We are proud to offer our beautiful tipis to you and are sure you will be proud to own one. We also are available to deliver, set up, and take down our products. We can even offer custom painting on your tipi with traditional Native American designs. 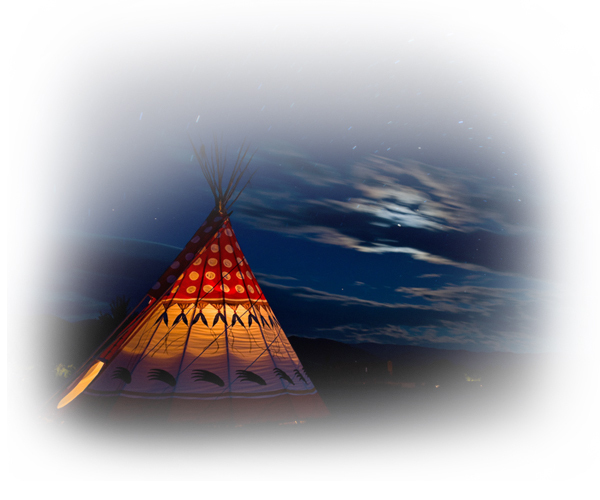 To learn more and see each of our complete line of Tipis, please call Dan at (866) 358-8547 or (406) 545-8600. We here at White Buffalo Lodge are proud of our beautiful, functional, tipis and the heritage for which it represents. We invite you to take a look!